How well can you cycle in winter conditions? Two weeks ago the Netherlands was covered with a thin layer of snow. Enough snow to make cycling very uncomfortable if the roads and cycleways hadn’t been treated, but they were. 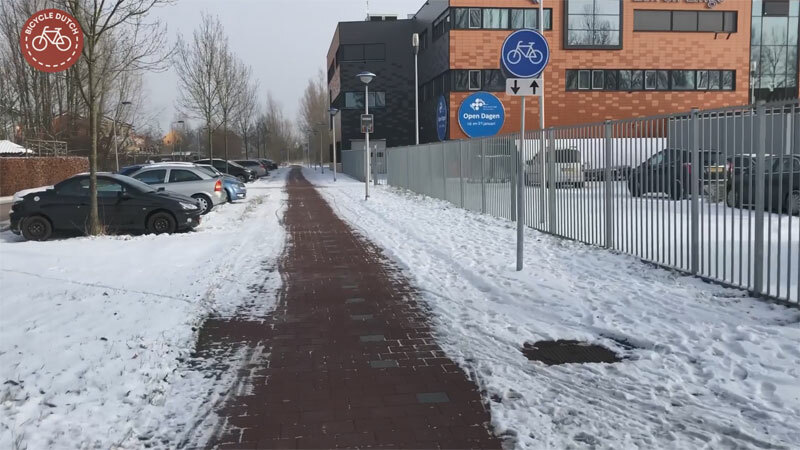 Luckily it is customary in the Netherlands to treat the cycleways as well as (or sometimes even better than) the travel lanes for motor traffic. 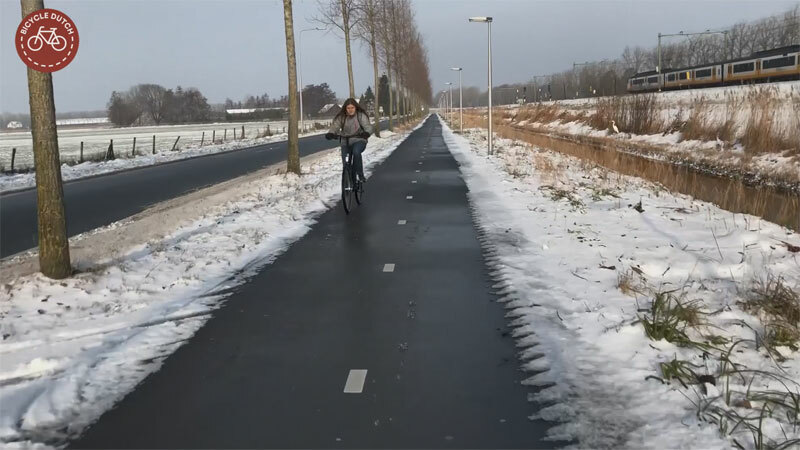 In this week’s double post I have two examples for you, showing how it is to ride in these conditions in the Netherlands. The only other person on a bicycle whom I met on this mid-day ride outside the built-up area of the municipality of Culemborg. The morning of Wednesday 23 January I had to be in Culemborg. This smaller town between Utrecht and ʼs-Hertogenbosch has featured in some of my previous posts already. 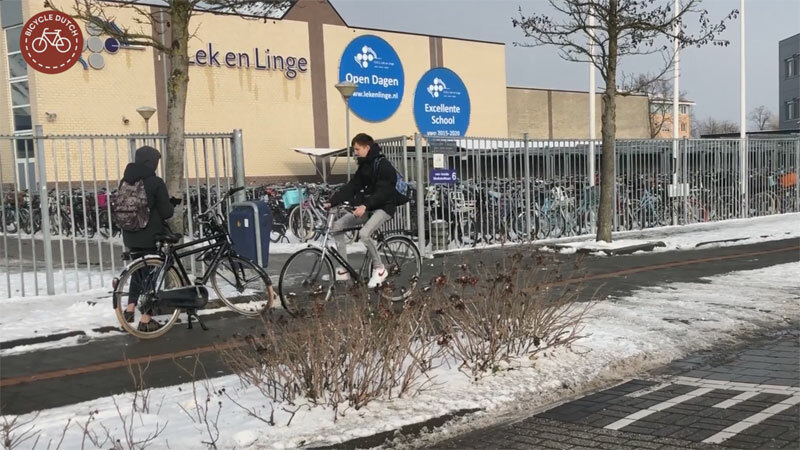 From the train on my way to Culemborg I could see that the main cycle route many school children take, coming from the direction of Geldermalsen, was perfectly cleared of snow and ice. On top of that it was a beautiful sunny winter day. After my appointment I did not take my rental bike back to the station right away. Instead, I cycled to the municipal border between Geldermalsen and Culemborg and I filmed the route the school children took that morning. Obviously the country road was almost deserted at noon: everybody was already at school, but at least it gives you an idea of what a cleared route in the countryside looks like. No wonder everybody can just cycle on in winter. You don’t need special tyres, you don’t need special gear. Just wrap up warm and cycle as you always do. If you want to see the route in the summer you can see it in this post from 2011 already! Enjoy the ride! 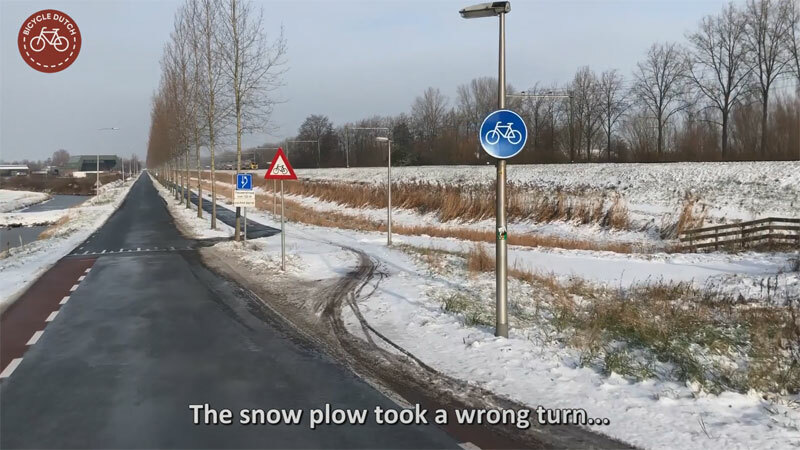 The beginning of the cycleway was not cleared because the snow plough had taken the turn to the roadway at the wrong location. Luckily, there had been enough people on bicycles here before me to make that short stretch of uncleared cycleway usable. This tiny bridge is still very convenient to get to the other side of the railway tracks. At a little over a metre wide it is much too narrow for a snow plough. It was a bit challenging to cycle on this bridge one-handed while filming the ride, but I managed to stay upright! In the built-up area the cycleways leading to some school buildings were all perfectly cleared too. 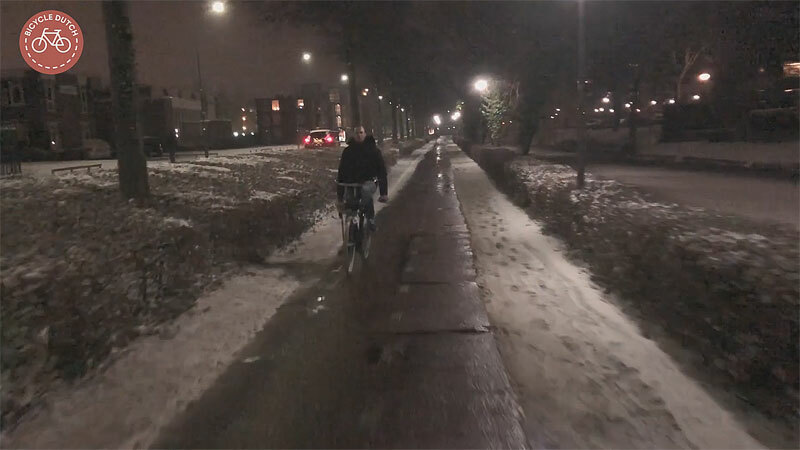 Not to their full width, but it is possible to use a narrower cycleway at a lower speed in winter conditions, that is no problem at all. These two school boys were already finished for the day and they were waiting for some of their friends who would also finish school early that day. Behind them you can see the school yard with the bicycle parking racks. My ride in the countryside of Culemborg. 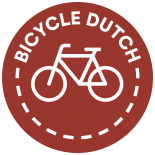 The night before, on Tuesday 22 January, I had cycled in my hometown ʼs-Hertogenbosch. I had seen complaints from some people on the internet who wrote that the cycleways weren’t cleared well enough for the evening rush hour. I cycled after dinner, at around 8 in the evening, to see how things were at that time and found the routes to be much better cleared by then. It had snowed all of that day. (The video from last week’s post was also filmed that very afternoon in Utrecht.) It was obvious that part of my route was cleared during the snowfall and some new snow had fallen after the path had been cleared initially. Another part of the route was clearly treated when the snowing had stopped. You will see that the beginning of my ride was in the car free shopping centre of the city. 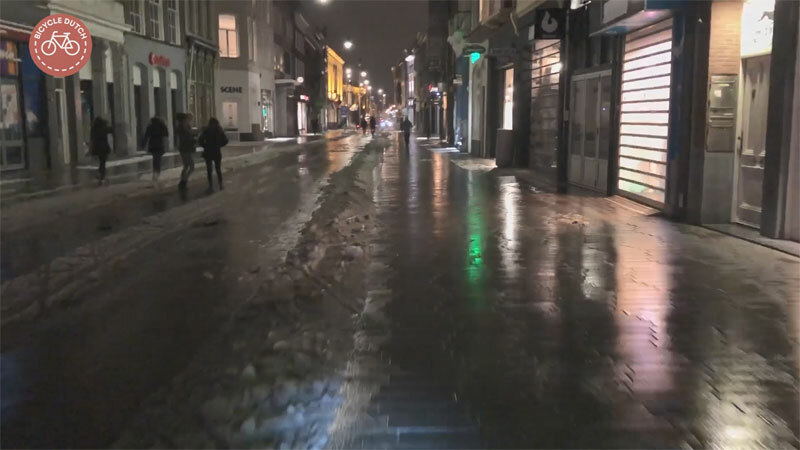 Those shopping streets were also cleared of snow, even though those pedestrianised streets are only used by people on foot and on bicycles. Some parts of the route were not (so well) cleared. I used some captions in the video to explain some of what you see. I rode all the way to the depot of the city. The facility where all the snow ploughs are stationed and where also the salt that is used to treat the roads, cycleways and footways is stored. I visited that facility for an older post. 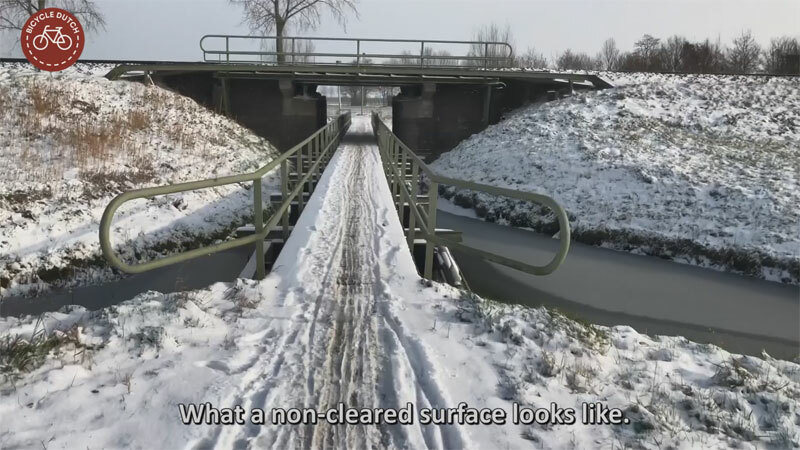 In which I explain how the gritting of the cycleways in ʼs-Hertogenbosch works. Enjoy the ride! This city centre shopping street was clearly treated. The brine that was spread made the snow melt without the need for vehicles to spread the salt. The shine you see on the picture is water, not ice, even though the temperature was well under freezing point. The freezing point for salted water is well below the normal freezing point. Where the shopping streets turned into normal residential streets, not for through traffic, the street was not treated at all. Still, I found it easy to cycle here with the camera in one hand and just controlling my bicycle with the other. This is the end of the 30km/h zone. The continuation of this street has a 50km/h speed limit and thus the types of traffic have to be separated under the sustainable safety policies. I wasn’t the only one cycling in the evening in ʼs-Hertogenbosch. The two-way cycle path is almost completely cleared of snow. There is a one-way cyclepath on the other side of the carriageway. You can see a person on a bicycle riding in this direction on the other side of the road, just to the right of the first tree on the left hand side. 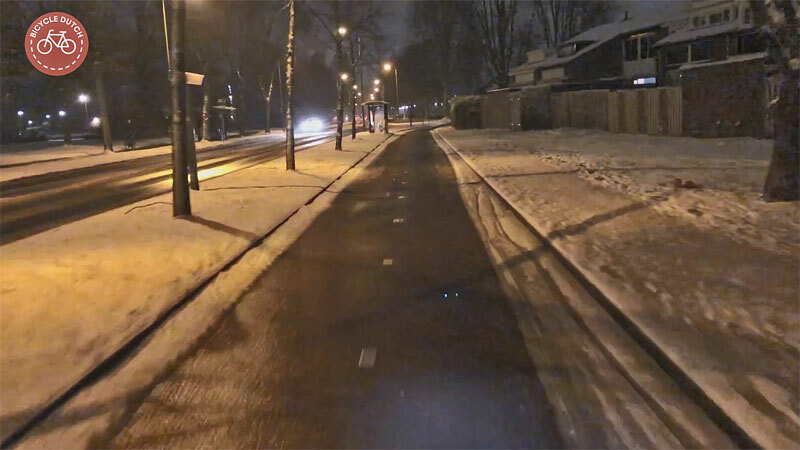 My night ride in the snow of ʼs-Hertogenbosch. OMG how immaculately straight are the lines of trees – and the trees “themselves” – in the first video. Neatness definitely seems to be a bonafide part of Dutch culture. Lovely “Slow TV” as well, if you know what that is. My local cycle path is not cleared of snow or ice. Anything that falls on the path stays there until it melts. It’s worse when it melts and refreezes the next day, and particularly so in areas which have been trod upon by people; the ruts and bumps are quite perilous to traverse even with studded tires (which I do have on my bike). The situation really is quite unfortunate as the cycle path was built under the assumption that it would be an alternate travel route to the roadways in town. The path certainly fills that purpose most of the year and in good weather, but when winter hits, the path is quite hard to ride. I end up detouring to the nearby streets after a good snowstorm. Anything more than a few inches on the ground is just about unrideable for me. Thanks for yet another interesting post. In recent days Swedish newspapers have published a number of articles/opinion pieces/letters complaining about snow clearance in Stockholm. Brushing the snow and spreading brine is becoming more common instead of plowing the snow and spreading sand/gravel, and the complaint has been that cyclists get fantastic conditions (i.e. wet asphalt) while pedestrians don’t (i.e. layer of snow/ice left). 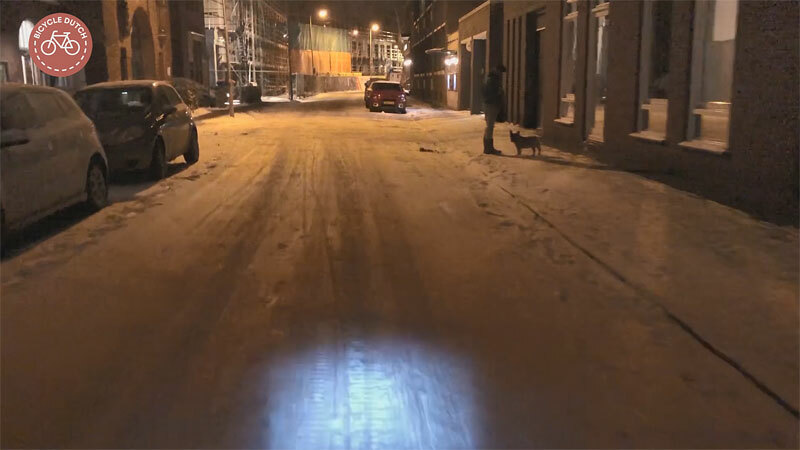 In your pictures it looks similar — asphalt on the bike path, snow on the sidewalk. What is the reaction from NL pedestrians? Do they walk on the cycle path instead? Sadly, in our municipality, we are struggling to even clear our sidewalks. Major roads are cleared the morning of a major storm, and minor streets the next day, but sidewalks are often uncleared all winter, yet many in our city refuse to even acknowledge this. Bike lanes share a similar fate. But this is unique for our city, many neighboring cities do clear their sidewalks, and we are very jealous. 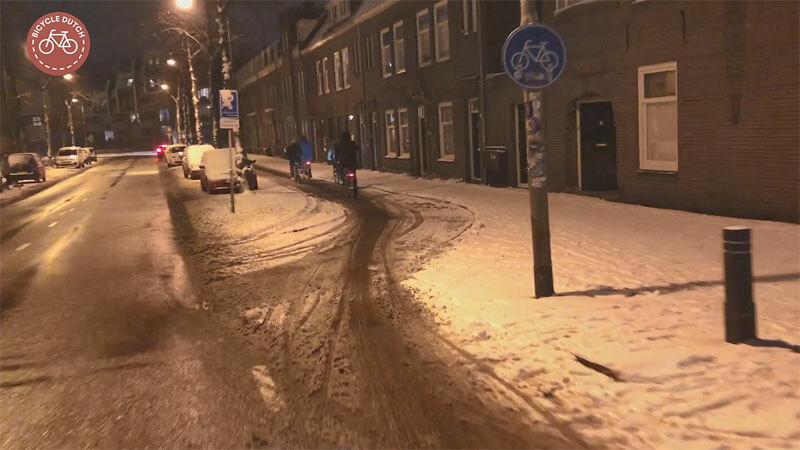 This entry was posted on 6 February 2019 by Bicycle Dutch in Original posts and tagged ’s-Hertogenbosch (Den Bosch), Culemborg, dark, gritting, ride, school, snow, Winter.